William Frederick Hulk was a landscape artist born in Holland in 1852, adopting England as his country after moving there as a young man. He was born into a family of artists: he was the son of the Dutch marine and canal scene artist Abraham Hulk Senior (1813 - 1897) and the brother of Abraham Hulk Jnr 1851-1922). His uncle, Johannes (John) Frederick Hulk (1829 - 1911) was a canal and townscape painter. His father travelled widely even going to America before settling in London in 1870 with William and his brother Abraham. William was taught art by his father and he soon became a well-regarded landscape artist and was a prolific exhibitor. He exhibited at the Royal Academy from 1876 to 1898 sometimes showing as many as 7 paintings a year. 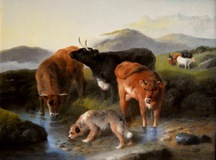 He also exhibited may works at the Royal Society of British Artists, the New Watercolour Society and the Royal Institute of Oil Painters. 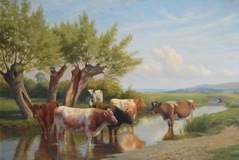 He lived in Guildford and painted many scenes of the surrounding Surrey countryside. 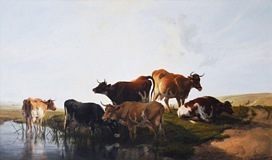 He specialised in paintings of rural landscapes usually with the inclusion of cattle, and the play of light upon water such as this lovely example. A number of his works can be found at various museums and art galleries including the Russell-Cotes Art Gallery & Museum, Brighton and Hove Museums and Art Galleries and the Haworth Art Gallery.